This bulletin board was adapted from an idea I saw in Mailbox Magazine. I drew off a large snowman using pink bulletin board paper. (It was pink due to extremely low supplies. :) ) I then photocopied snowflakes that had blanks for students to fill out books that they had read and taken AR test on. We hung up the snowman during the first week in January and I challenged students to fill out enough snowflakes to cover the entire 5 (or so) foot snowman. If students succeeded they would be treated with ice cream sundaes. There were a few stipulations. In order for the snowflake to get put on the snowman the book had to be on or above their level and they had to score a 70% or higher on the test. They not only met, but exceeded my challenge. 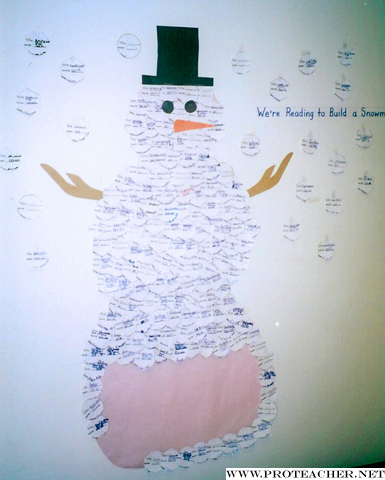 Approximately 275 books later our snowman was filled in. We were so excited that we have continued with another challenge. This month they are reading their way into Mrs. __ Heart for a popcorn party.